After watching SongAh see Kevin at the lift, we see a healthier SongAh walking into work. Her mind is still wondering if it was Kevin who stroked her hair, and comes to conclusion it was just a silly dream. After what must have been a very awkward lift journey, as SongAh declined a call from Kevin, who appeared in the opening lift as she did so, the pair end up on the roof. It’s pretty awkward, but SongAh tries to joke that he is drinking coffee, even though he won’t let her. 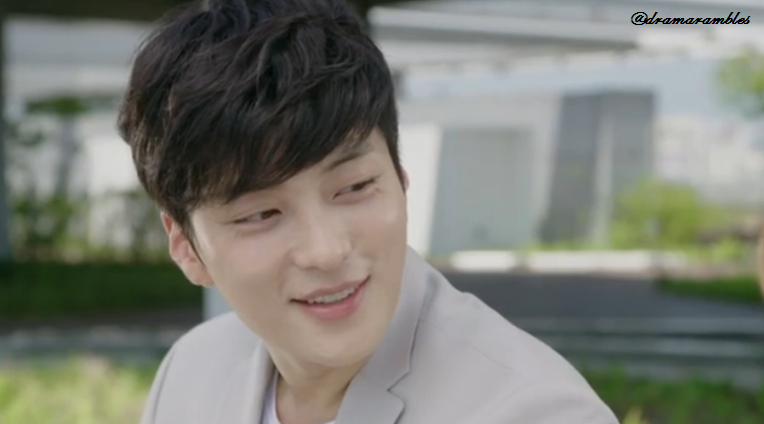 The conversation turns to her rejecting his call (instigated by SongAh), and SongAh explains that his behaviour is odd for that of a Korean person. 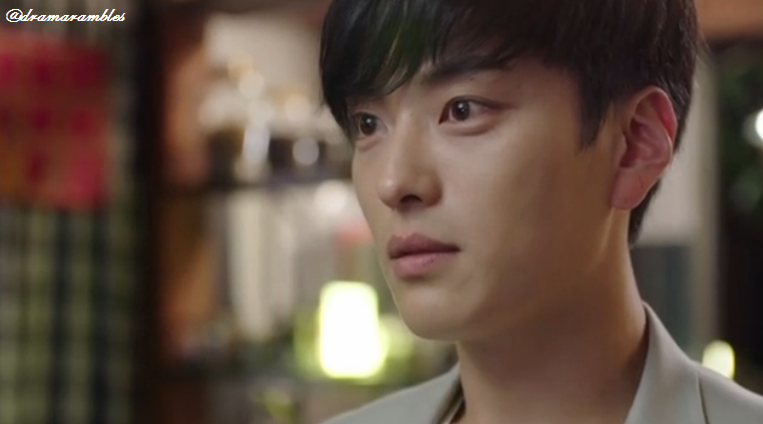 She tells him people could misunderstand, to which Kevin’s opinion is “let them misunderstand” (so helpful haha) and he further explains that to him, she is not a friend, but “Park SongAh, the one I like” (did he just confess?! I should not feel so happy right now. I need GookDae to step up for my insanity’s sake!). Kevin explains that he has always wondered what her expression would be when he told her, and he doesn’t seem happy that she looks so shocked. SongAh then finally gets an answer to her question, but it’s not as straightforward as she’s hoped. Kevin asks if it was him that stroked her hair would it change their relationship and when he sees her expression knows she hoped it wasn’t him. This causes him to tell her is was just a dream (but there is definitely something else going on here, and I’m going with we didn’t get the whole picture last episode). At their meeting, the team headed by Kevin are going through what they need to do for a presentation and SongAh has an idea. She thinks it would be good if they had food samples, which DoekHee builds on and suggests FLada much to SongAh’s horror. However, Kevin rejects the idea, saying they need a professional chef (burn! although he is a professional chef… right? That’s his job) and this causes a sort of awkward tension. Which of course, DoekHee is oblivious to as she says she was trying to build a bridge between SongAh and GookDae! 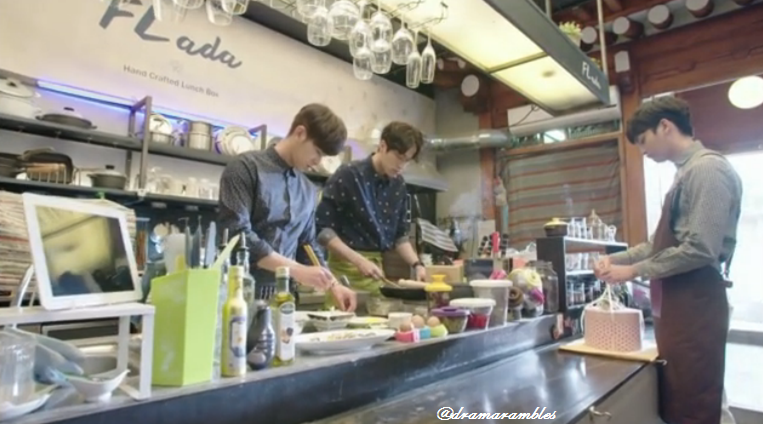 Meanwhile at FLada they are all preparing food, however, GookDae makes a mistake. SooRi sidles over to BiRyong and whispers to him that it seems like GookDae is relieving his anger, which BiRyong can’t help but agree. SooRi then directs his words to GookDae, telling his the famous restaurant’s food was great and asking why he didn’t turn up (maybe he was too busy helping the person SooRi brings up next?). Of course, SooRi brings up SongAh and promptly gets a hand to the mouth from BiRyong. Not impressed with the whole situation GookDae throws in the towel and leaves to do the deliveries. Once again SooRi is shocked and wonders where the delivery is that GookDae would do it himself. At SongAh’s office, the whole team are busy cleaning up their working spaces and DoekHee is more than unimpressed. However, she is forced to grumble alone as SongAh gets told to run an errand. As SongAh walks down the corridor she wonders if Kevin really confessed to her or was just testing the waters. This is something she’ll need to think more of, but not right now as SongAh becomes too busy running back down the corridor as she spots GookDae coming out of a lift (she has such grace! haha). While GookDae strolls casually down the corridor, SongAh continues to run and hide. At one point she wonders why she is the one hiding, but as he comes closer she continues to run and hide! ordered for her has arrived, as his heart was aching when he saw her unwell (this kid is growing on me! So sweet!). Just then GookDae walks into the office and is greeted by the rest of the staff bowing, and then being confused as he isn’t who they were expecting. GookDae is here to deliver her a lunchbox. They point GookDae to where she is, while SongAh pretends to be asleep. He smiles to himself and walks over to her desk (I love that DoekHee checks him out as he passes her haha!!). For several moments SongAh pretends to be asleep, her thoughts loud and clear and if they wasn’t enough, her eyebrows were doing a good job of showing them (haha). SongAh didn’t “wake up” when her phone started ringing (GookDae had to decline the call), but as soon as she heard the Director was coming, she was up like a shot (GookDae looked so confused haha). SongAh quickly bows, but the Director’s attention is caught by GookDae who didn’t. Kevin is surprised by GookDae’s being there, but walks with the Director without saying anything. SongAh whispers to GookDae to greet the man, but GookDae doesn’t see why he has to, but does so anyway (even if it is a little halfheartedly ha!). Director wants to know who he is and why he is there, but GookDae isn’t very quick today and SongAh has to step in for him. She tells the Director that GookDae is the owner of the restaurant which they are doing a collaboration with. Kevin then jumps in to help her, to explain that they want to offer food samples when they do the presentation. The Director is happy to hear this and even shakes GookDae’s hand. As they walk away, Kevin gives them an annoyed and exasperated look. Neither GookDae nor SongAh are happy either. 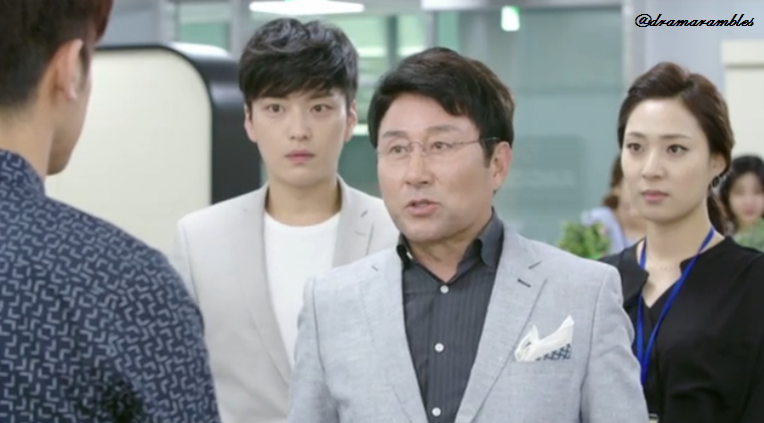 Outside SongAh’s office building the two begin to bicker (like old times!) and SongAh tells him he should have at least called her first. However, we find out that GookDae erased her number, which gets her riled up even more. SongAh proclaims that it doesn’t matter as they won’t see each other again, but is caught off guard when GookDae asks about the collaboration. SongAh didn’t think he’d do it, but he has a point when he says she was the one who already proposed it. SongAh tells him not to do it, but GookDae see’s no reason why he shouldn’t. He tells her if she doesn’t want to do, then she should tell the Director and then walks off. 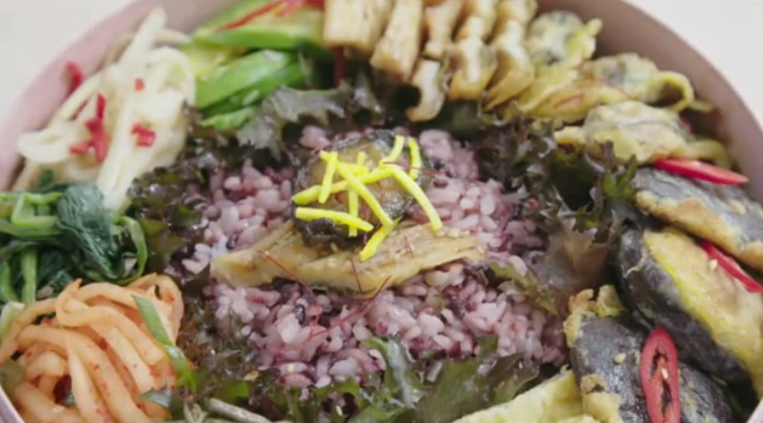 Back at the office, the staff are staring at delight at the lunchbox GookDae brought with him. DoekHee is jealous of her and calls GookDae delicious (but from the strange looks says she was talking about the food! haha). 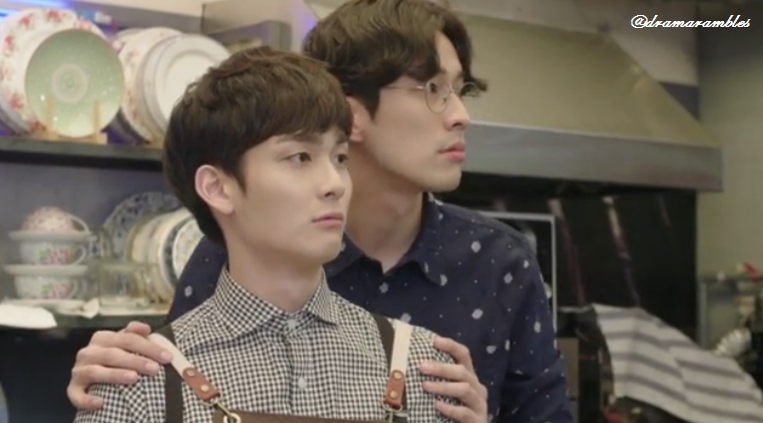 The team them start to suspect that SongAh planned all of this to look good in front of the Director. DoekHee says she isn’t smart enough for that, but the others disagree, and continue to say mean things. 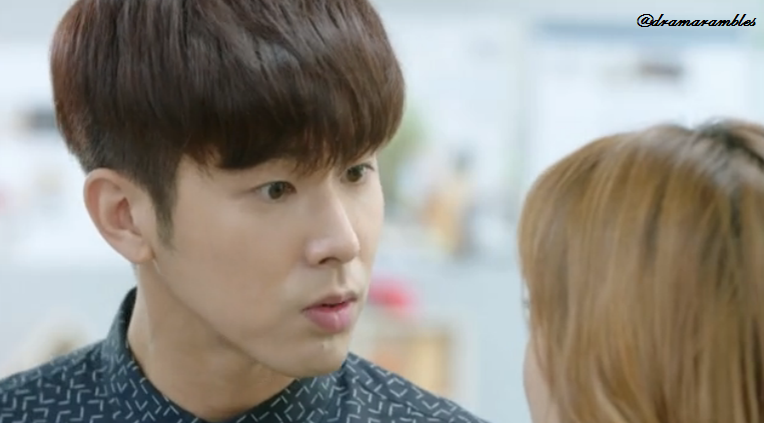 They are all shocked when DoekHee turns round and says SongAh’s name. The member’s act nice to her as they walk away or simply shuffle off. DoekHee tells her that it’s because they are jealous and guiltily slinks away as well. SongAh is fuming as she power walks through the building. She stops at the Director’s office door and thinks about some moments (the not so great menial labour ones as well a snippet of the kiss~) she spent with GookDae, and is determined to sever ties with him. She knocks and enters the office. Later in the evening, while GookDae is preparing cookies (which look so tasty! ), Kevin comes in and he wants to ask something personal. He wants to know if GookDae likes SongAh. GookDae calls him rude and doesn’t see why he should answer, even if Kevin does like her. GookDae says “Park SongAh likes me” and when asked if he likes her back, GookDae says the answer is only for SongAh. But, GookDae may not have the chance as Kevin then orders a ‘proposal box’, much to GookDae’s amusement (and shock no doubt). After being called a coward for having GookDae make the box, Kevin says it’s because he has already cheated. Kevin goes on to explain that he saw him at the hospital (1. that’s why he was looking so serious at the lift and 2. knew it!! 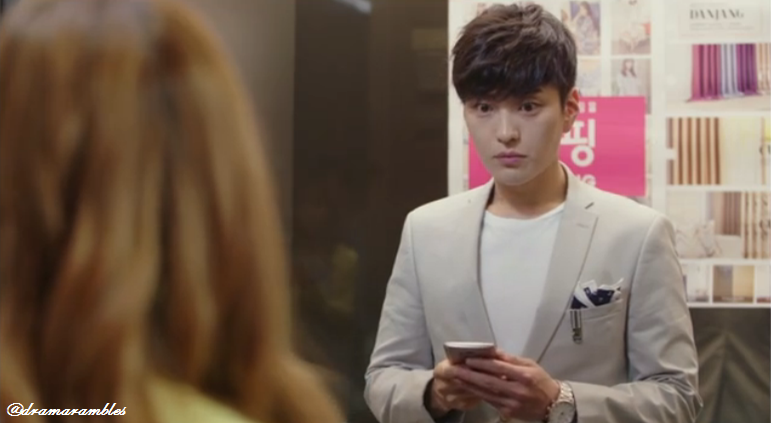 Dramaland romances cannot fool me haha ^^”) and then asks GookDae if it was him who comforted SongAh at the hospital. After the preview, we got a small clip (please let them have returned for good!) of GookDae comforting SongAh in the hospital. For a moment I thought I would have to reevaluate my life if it wasn’t GookDae who had been comforting her and wasn’t the one who caught her. But of course, it was!! And with this revelation, I’m happy to see how the two men sort this out, or more likely glare and try to one up each other. For GookDae I hope this makes him stand up and try to be the kind of person who I think he wants to be for SongAh. And SongAh, I just want her to stay her hilarious and feisty self! Yup. Kevin is still putting off those creeper/stalker vibes to me…especially now that he plans on proposing. WTF? How is that supposed to be romantic? They aren’t even in a relationship. His personality is so off putting to me. 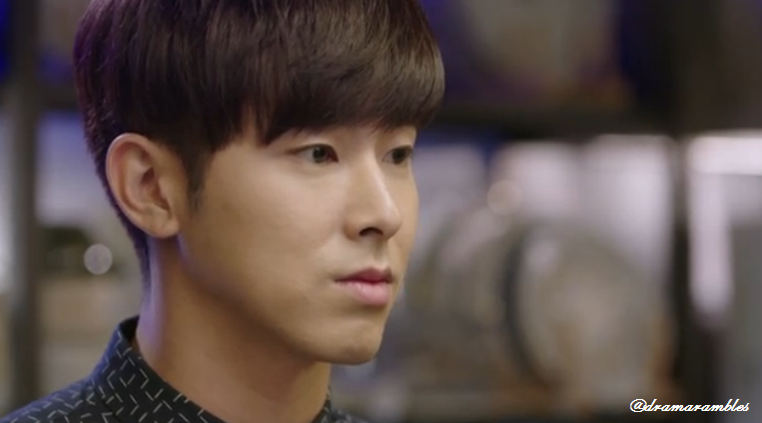 As a second lead he is a serious fail in my book, heh. He is just too audacious in his blind pursuit of her that he is not believable as a potential mate.